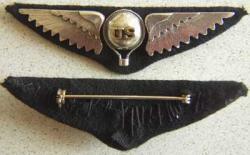 The wings that are shown are a museum quality reproduction of Balloon Pilot Wings. The original designer is not known, it appears that this was a one of a kind design. This museum quality reproduction is made of Sterling Silver with the letters US gold plated. The silver parts are mounted on a plate which is covered by the wool cloth.